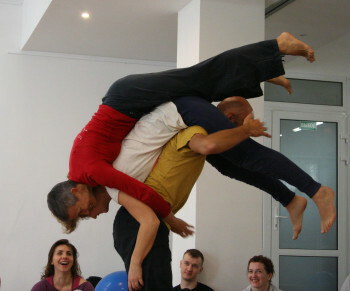 The Contact Improvisation Jam is a part of contact improvisation practice and offers an informal space for dancers to play to be focusing on movement. MegaJAM Fest open the possibility to practice for 5 days all the Jam format. We start opening the jam with warm up (Anjelika Doniy) in Wednesday 24 April at 20.30.00 pm and we close on Sunday 28 dic. at 20.00 pm. (mas o memos). This is all that we know and all there is to know, the time and location…. then every day we will create together.